I was sitting in the middle of a very messy sewing room feeling uninspired, but I wanted to make a quick something for the bazaar. I was starting to get frustrated when I remembered seeing Tamiko's beautiful, simple quilt the other day. Bingo! I had a Kona charm pack and this was easily a project I could whip up in an evening. Hooray! I accidentally left out a whole row because it fell beneath my sewing chair, but, in retrospect, I'm happy it got left behind since it was another whole row of green and I think it would have been too much. My natural instinct with rainbow quilts is to bind them in a grey or black--I've done this on two previous rainbow quilts. For this one, however, I chose a solid red for binding because I wanted to keep the quilt gender neutral and still baby-ish. I thought grey or black would seem too modern. I am most happy with the back! My hubby thinks I should display the quilt this way because he thinks its so cute (no he didn't use that word). I traded for this old Alexander Henry print a long time ago, but I've never found the right project for it. I knew I wanted it for a baby quilt backing, but I could never decide on a quilt top design that would match. This was a perfect fit, literally! I couldn't even trim an inch around after I finished quilting. I used up every last centimeter of backing! Simple, fast, and satisfying, what more could you ask for in a project? so cute, Kelly. I saw that quilt, too, and wanted to copy it immediately! I think it turned out perfect! Love the rainbows on the back and the front...plus I really would be surprised if this didn't sell. Its Noah's Ark and didn't you say the Bazaar is at your church? I like the red binding. I think the gray would have been too boring on this quilt. Just because it is already really simplistic. Got a feeling I may be 'inspired' by this too!! Such a fun and happy quilt!! 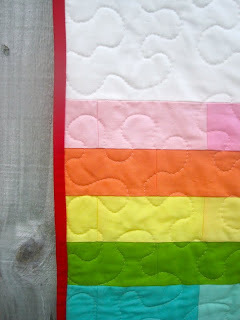 I almost agree with your hubby re displaying the back except that I love the front too - great baby quilt! Looks great! I'm so glad that you were inspired to make your own! 10 Down, 20 to Go!